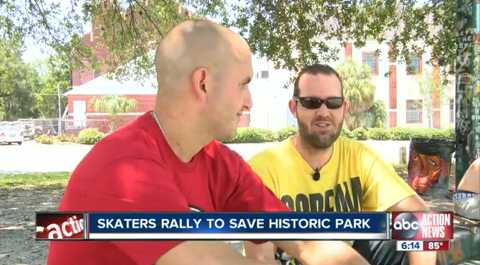 Some would lead you to believe that the campaign to preserve the Bro Bowl is relatively new and merely a last-ditch effort to impede the progress of modern skateboarding and the City of Tampa’s plans to revitalize Perry Harvey Sr. Park. This article from 2006 contains evidence to the contrary. Published long before local journalists aligned themselves with the political agenda that seeks to destroy a piece of its own City’s history, the article clearly states how the community has felt for nearly a decade. Misinformation has been the most popular tactic employed in the effort to destroy the Bowl. First, it was that the Bowl had to go because of the widening of Orange Avenue, (which was later refuted) and then it stood in the way of honoring Central Avenue History (which has also since been proven false). Now it has come down to the Bowl must be demolished “just because”. During the latest discussions the City has maintained that the “consensus” supports their plan. Take a few minutes to read this article that dates back to when the topic of destroying the Bowl was first introduced and note the details. Considering the direction Perry Harvey Sr. Park is headed, many elements of Central Avenue will reborn, including soul, jazz, and segregation. 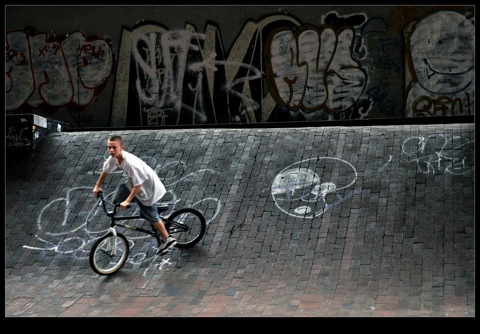 Which way do you go when renovating a park that has historical significance for black residents - and for white skateboarders? On this date, June 11th, forty-seven years ago, a young, unarmed, African-American man by the name of Martin Chambers was shot and killed by one white Tampa Police officer by the name of James Calvert. According to a Tampa Tribune article dated June 12, 1967: “The .38 caliber bullet struck Chambers square in the back and killed him almost instantly. 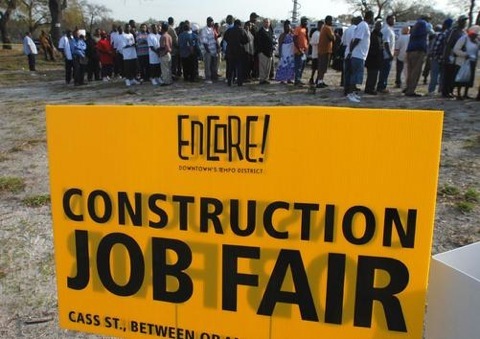 Within the hour reports of the shooting spread throughout the Central Avenue Housing project as residents gathered in the streets and near the shooting location to seek immediate answers.” The African-American community reacted almost immediately following the shooting. Riots, violence, and the burning and looting of local businesses quickly ensued. Several buildings along Central Avenue were destroyed as tensions continued to mount. As the State Attorney Began to investigate the incident, rumors spread surrounding the shooting and the violence and destruction continued. A mere two days later Officer Calvert was exonerated of all charges as the shooting was ruled “a justifiable homicide". Several days of civil disturbances continued and ultimately peace was restored by a community group which came to be known as “The White Hats”. You may ask, what does the shooting of a teenager and civil unrest have to do with the Bro Bowl? It has a great deal of significance. After the White Hats restored order, the community was asked what they would like to see in order to provide for a positive outlet for the youth of Central Avenue. 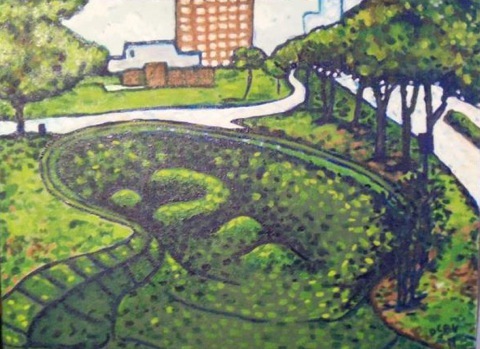 There were several suggestions, and amongst them was the desire for a municipal park within the urban corridor for African-Americans to enjoy. 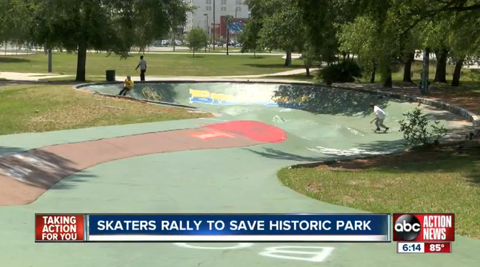 Tampa City Council passed resolution 3692-F on December 11, 1975, which provided for the construction of said park. The park, which was later named in honor of Perry Harvey Sr., contained several amenities for the youth. Among them were tennis and basketball courts, a splash fountain for children of all ages, and both skateboarding and roller skate rinks. While some claim that the Bro Bowl and Perry Harvey Sr. Park share none of the history of Central Avenue, and would rather focus on figures such as Ray Charles, Ella Fitzgerald, and other famous entertainers, we invite you to discover a chapter of Tampa history that is seldom discussed. Central Avenue and the businesses there were erased forty years ago, only to be honored in the same park through the destruction of a piece of that same said history. How many encores of this dark chapter of our history can our city endure? If you have any historical documentation, vintage photographs, or narratives that pertain to the Bro Bowl and/or its history or significance, please email us here. 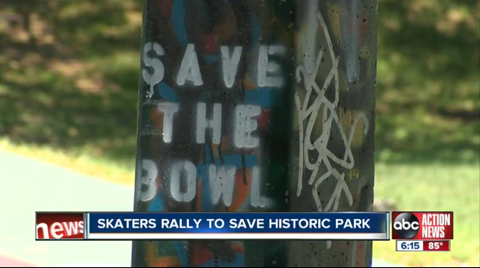 We are trying to collect and document as much of the Bowl's history as possible. Protest the THA's choice neighborhood grant application in this article if you want to keep the bowl from being "re-designed." The Bro Bowl got a new paint layer! How thick is that paint now? "Took a trip to Tampa and found some guys with skills! 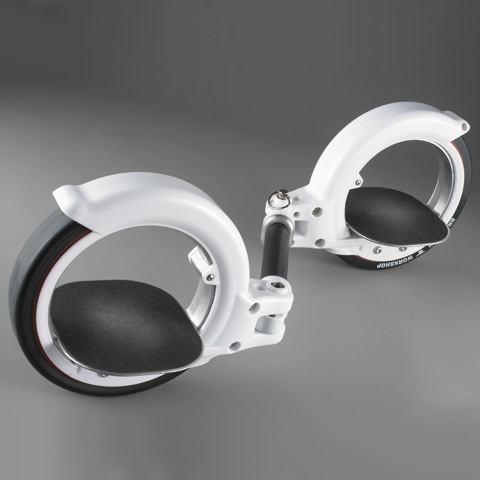 The Freerider Skatecycle takes flight." 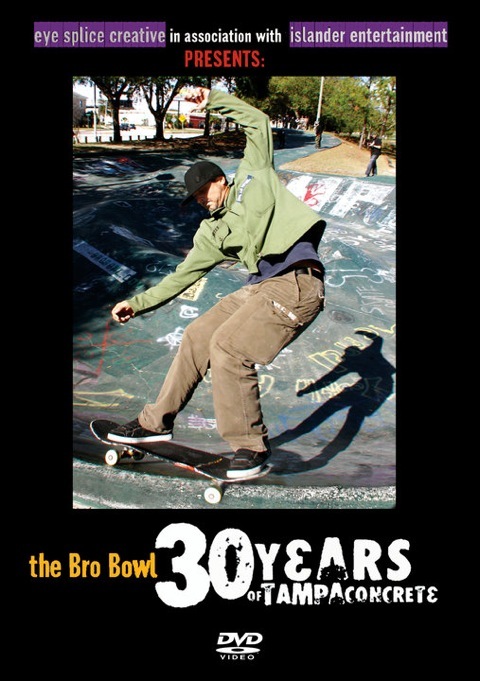 DVD cover art for "The Bro Bowl: 30 years of Tampa concrete"
The End of the Bro Bowl? 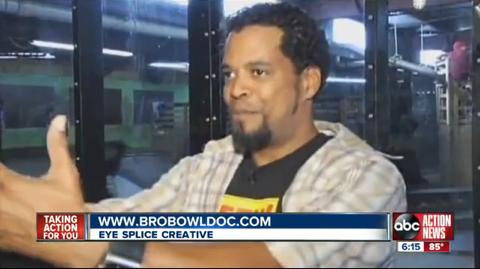 From Edwin Velez: The End of the Bro Bowl? 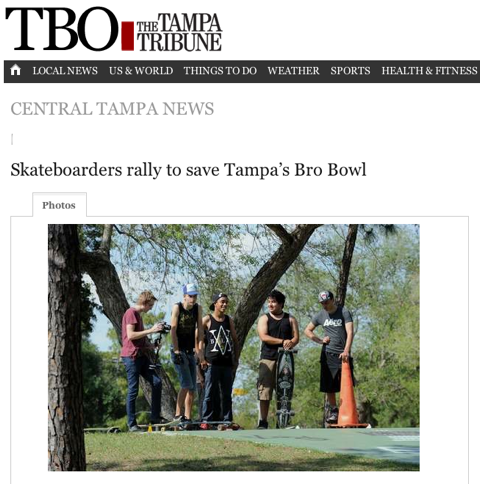 The Bro Bowl: 30 years of Tampa Concrete documentary gets a special mention on the Yahoo! Sports Channel, Grind TV! 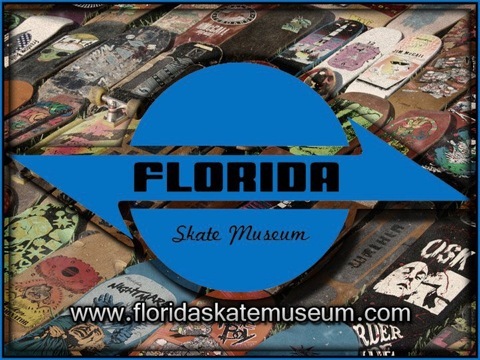 The documentary, The Bro Bowl: 30 years of Tampa Concrete, is on the LA Skate Film Fest radar. 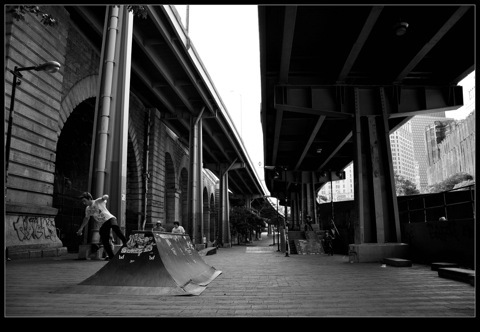 A plaza under the Brooklyn Bridge, the place to go for skateboarders, is about to become a construction zone. Photos courtesy of The Juicer/Shipra Chauhan. Visit her on Flickr.